Lord Denning, OM, PC, former Master of the Rolls, died on 5 March 1999 aged 100. He was born on January 23, 1899. This picture was taken by me in 1986. Like so many others, I had the honour when I was a student in London to have met and corresponded with the greatest Commonwealth judge of this century, the late Lord Denning. He inspired me greatly and gave me hope and faith in the universal principles of fairness and justice. It is therefore befitting that I pay tribute to this remarkable man and a friend. Below is the obituary published by The Times of London on 6 March 1999. Lord Denning was Master of the Rolls from 1962 to 1982 and, in all, held high judicial office for a remarkable 38 years. Towards the end of this long period it often happened that experienced counsel appeared before him who had not been born when he first went on the Bench. He lived to become the most widely known member of the English judiciary and in retirement he remained in the public eye for his forthright pronouncements on a wide range of legal issues. He had a romantic belief in English law as one of the supreme creations of man; if he laid what some thought were sacrilegious hands upon the sacred scrolls, it was not because he loved law less but because he loved justice more. He felt that when the law ceased to be sensible, flexible and fair it was failing in its vital and historic mission; if it needed a shaking-up in order to ensure that it adopted a modern and relevant posture, he was ready and willing to administer the necessary and salutary shock. Alfred Thompson Denning was born at Whitchurch, then still a small place deep in rural Hampshire (he never lost his attractive regional burr). His father was the village draper. The Dennings were a remarkable family. An elder and a younger brother became, respectively, a general and an admiral; the promise of two other brothers remained unfulfilled, as they were killed in the First World War. Alfred (or "Tom", as in due course he came to be called by his friends) went to Andover Grammar School, from where he won a scholarship to Magdalen College, Oxford. The First World War interrupted his university career and he served from 1917 to 1919 with the Royal Engineers. After demobilisation, he obtained a double first in mathematics, and became a schoolmaster at Winchester for a year. He was an inspired teacher, but he soon decided that his life's work did not lie in this sphere, so he went back to Oxford again, and in a remarkably short time secured his third first, this time in law. Denning was called to the Bar by Lincoln's Inn in 1923. There were giants in the profession in those days: the great criminal advocate Marshall Hall had reached the summit of his tempestuous career, while Norman Birkett and Patrick Hastings were fast coming to the front. Denning did not set out to become a passion-tearing rhetorician, a spellbinding orator or a pitiless cross-examiner. He was fascinated by what Pollock had called "our Lady the Common Law" (though he later became critical of the blemishes which marred the lady's beauty and did much to remove them by judicial surgery). He revelled in hard work, with the result that every time he went into court he had at his command a complete knowledge of the facts and law appertaining to the case. With this important advantage (not always shared by his opponents) he was able to present his arguments cogently, courteously and comprehensively. He was a straightforward advocate, and was contemptuous of the forensic fripperies and parlour-tricks which were dear to one school of advocates unhappily still flourishing at that time. Denning soon acquired a good and widely-ranging practice. In London he was much in demand in cases involving intricate questions of commercial law. On the Western Circuit (to which he naturally gravitated) he appeared in many criminal trials. He somehow found time to act as joint editor of new editions of two indispensable text-books: Smith's Leading Cases (1929) and Bullen and Leake's Precedents (1935). As he was a devout and assiduous member of the Church of England, it was predictable that he should have been made Chancellor of the important dioceses of Southwark and London. In 1938 he took silk and was an immediate success in the front row. He was clearly in line for promotion, for in 1943 he was sent on the North Eastern Circuit as a Commissioner of Assize. In 1944 he became Recorder of Plymouth, but he had no opportunity of cutting his judicial teeth in this approved fashion, and he was almost immediately elevated to the High Court Bench. He was 45, well below the usual age at which High Court judges were appointed in those days. In accordance with tradition he was knighted, and also elected a Bencher of his Inn. Denning was first assigned to what was then a cosy backwater, the Probate, Divorce and Admiralty Division. Within a year he was transferred to the more workaday world of the King's Bench, but it only gradually became manifest that a man of quite unusual quality and outlook had joined the ranks of the judiciary. Nevertheless, from the start his lucid and fluent summings-up to juries made a good impression, while his attractively phrased judgments showed encyclopaedic knowledge and understanding of the law. It needed no sixth sense to detect that his approach to archaic precedents was less than reverential. While still a very junior judge in 1946 he was appointed chairman of the Committee on Procedure in Matrimonial Causes. The far-reaching recommendations proposed in the committee's reports bore the obvious imprint of the chairman's original and reforming mind. Something of the shape of things to come could be seen when he delivered and later published the first series of Hamlyn Lectures, Freedom Under the Law (1949). Denning's ascent of the ladder of judicial promotion was rapid. He went to the Court of Appeal in 1948 and in 1957 to the House of Lords. It was when he reached the top rung that he fully emerged as a courageous and controversial opponent of what he regarded as legal obscurantism. In his speeches in the Lords and in his Romanes Lecture in 1959 he seemed to go so far as to claim that the House of Lords, in its judicial capacity, should take legislative powers to itself and should change the law when it needed changing, rather than wait for the more leisurely parliamentary processes. This doctrine was repugnant to the champions of orthodoxy led by Lord Simonds (a former Lord Chancellor), who expressed his distaste for "a naked usurpation of the legislative function under the thin disguise of interpretation". The outlooks of Simonds and of Denning were so much in conflict that it was obvious that the latter could not be happy in the House of Lords as long as the former frequently presided there. When Denning returned to the Court of Appeal as Master of the Rolls in 1962, it was an open secret that this incompatibility was the reason for such a very unusual step being taken. Denning made one or two trenchant comments about the situation. He said that the House of Lords was rather like Heaven - everyone wanted to get there, but not too soon. He also explained his preference for the Court of Appeal by saying (not more than three-quarters jokingly) that in his new role, sitting with two colleagues instead of with four, the odds against justice being done had shortened from 4-1 to 2-1. Denning was now 63. Among practising and academic lawyers he was well known as a dedicated and uninhibited reformer, but his fame had not spread much beyond the narrow confines of that world. The situation changed dramatically when, in 1963, he was appointed by the Prime Minister, Harold Macmillan, to investigate and report upon various aspects (especially those relating to security) of the Profumo affair. This assignment brought him into an unfamiliar world of low behaviour in high society, adultery and drugs, counter-espionage and journalistic scoops. Denning's report, compiled and completed with remarkable speed, was a masterly document, though some thought that it bore traces of a certain naivety. Reading rather like a Mills & Boon novel, it was an immediate bestseller, and its author's name became a household word. Denning's most enduring work was done in the Court of Appeal both before he went to the Lords and after he returned from it. It was in a dissenting judgment of his that the doctrine of liability for negligent statements as well as for negligent actions was first adumbrated - a view which was finally accepted by the House of Lords. Perhaps the most consistent thread in all his judicial activity was to be seen in his efforts to safeguard the position of separated wives so far as their property was concerned. Here again he was sometimes overruled, but received powerful support from the proposals of the Law Commission which in due course found their way into the statute book. A number of cases between 1975 and 1982 brought Denning a renewed bout of national publicity and further enhanced his already high reputation and popularity among the general public as a judge dedicated to defending the rights of the individual, the ordinary citizen, against the forces of bureaucratic government. During that period the Court of Appeal, with Denning presiding, declared unlawful the Home Office's attempt to force people to pay more for their television licences before newly increased rates had come into force; and it decided that the Secretary of State for Education had misdirected himself in trying to force comprehensive education on a reluctant local authority. In the Gouriet case of 1977, in which John Gouriet, director of the National Association for Freedom, took legal action to try to prevent a boycott of mail to South Africa by postal workers, the Court took the view that an individual was entitled to come before the courts even though the Attorney-General had refused him consent to do so. That decision was reversed unanimously by the House of Lords. During one period, indeed, nine Denning decisions in a row were overturned, though it would be wrong to think that he was in a perpetual state of undeclared war with the House of Lords, or that he was often in a minority in his own court. A large number of his judgments in cases of great importance embodied the unanimous opinion of the Court of Appeal. In the field of industrial relations and labour law Denning found himself, somewhat to his surprise, the centre of political controversy. A series of decisions by the Court of Appeal, and some remarks he made in court and on extra-judicial public occasions, had given some trade unionists and Labour Members of Parliament the impression that he was biased against the unions. For a time he was the subject of criticism, both within Parliament and outside. Denning was not, of course, anti-union. He was, however, against the misuse of power and he believed the trade unions to be a source - though not the only source - of such abuse. When asked to deliver the 1980 Richard Dimbleby Lecture for BBC Television, he chose as his theme The Misuse of Power. Astonishingly, at the age of 80, Denning became a successful author, a role that he accepted with obvious delight. 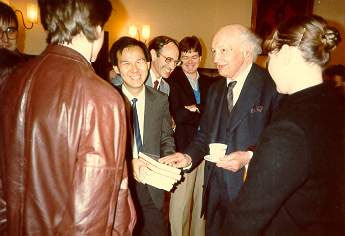 Lawyers queued outside the legal bookshop near the Temple for the privilege of purchasing a signed copy of The Discipline of Law (1979). It reached the national bestseller lists. A personal account of Denning's most important cases, it contained excerpts from his judgments interspersed with explanations and anecdotes delivered in his endearing individual style. He followed that with a second work in the same mould, The Due Process of Law (1980). In a third book, The Family Story (1981), he told of his early years at the Bar and on the Bench, of his first marriage, the idyll ended by his wife's early and tragic death, and of the enduring happiness and contentment he later found with Joan, his second wife. Above all, it is a moving tribute to his deep roots in the Hampshire he so loved. His next book, however, was to lead directly to his retirement, in circumstances which caused him considerable distress. In What Next in the Law (1982), his thoughts on law reform, some remarks were found offensive by the black community - unfortunately so, for no judge had done more during his lifetime to welcome students and lawyers from the new Commonwealth into the English legal community, and no judge was more highly regarded in the English-speaking countries of Asia, Africa and the Caribbean. Denning apologised publicly, the book was temporarily withdrawn, and he announced his intention to retire. His reign as Master of the Rolls came to an end on July 31, 1982, not inappropriately amid another flurry of controversy, this time over a decision that Sikhs were not a racial group for the purposes of the race discrimination laws. The ceremonies attending his retirement were marked by an outpouring of affection not often accorded to a member of the judiciary, although, given his eminence, it was somewhat surprising that he had to wait until 1997 to be appointed to the Order of Merit. Happily, in retirement Denning did not disappear from public life. From his Hampshire home he produced a stream of opinions - not all of them considered, but all widely quoted - on the legal and moral issues of the day. Like the judgments he had given in office these ranged from the radical to the extremely conservative. Thus, during a water workers dispute he urged householders without water to effect their own repairs and bill the local authority; he urged dockworkers' unions to sue the Government over docks privatisation; he criticised the law lords for the injunction on the publication of the book Spycatcher, by the former MI5 agent Peter Wright. On the other side of the coin, he called for the castration of convicted rapists; for the death penalty for child murder; and had to apologise publicly for saying in an interview with The Spectator that the Guildford Four were "probably guilty". Nevertheless his views on the law continued to be sought, and given, for the edification of lawyers and ordinary newspaper readers alike. He also became a famous litigant himself, and his various (and generally losing) court battles - over the ownership of his old junior school at Whitchurch; over a village green; and over the preservation of pedestrian rights to a footpath across his land - were often in the headlines. As a man Denning combined confidence in his judgment with a basic humility. The most callow student could be sure of the same interest and encouragement as the most weighty contemporary. He was friendly with the young because he enjoyed their company. He was a teetotaller, but he never thought that, because he was virtuous, there should be no more cakes and ale. He loved parties, and was more sparkling on lemonade than most men on champagne. In 1963 Denning bought a beautiful Regency house in Whitchurch, and for the rest of his active life he happily played his part in the affairs of his birthplace. For many years he carried out his duties as president of the local cricket club with the same combination of conscientiousness and relaxed good humour as he brought to his presidency of several organisations of national importance. Denning married first, in 1932, Mary, daughter of the Rev F. N. Harvey. She died in 1941. He married secondly, in 1945, Joan, the daughter of J. V. Elliott Taylor, and widow of J. M .B. Stuart. She died in 1992. The son of his first marriage survives him.